Get $20 OFF Auto Services $100 or More. Get $30 OFF Auto Serviced $250 or More. Get $50 OFF Auto Services $500 or More. Plus earn up to a $200 Visa® Prepaid Card by mail with purchase of $499 or more using your Synchrony® Car Care credit card*. Subject to credit approval. See store for details. Offer Valid through April 30th. *Rebate in the form of a Visa Prepaid Card. 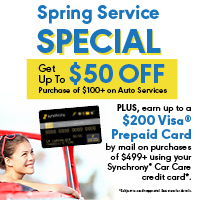 To be eligible to receive a rebate under this offer you must: (1) Make a purchase of $499 or more 3/1/2019 – 5/31/2019 with your Synchrony Car Care Credit Card or Truckers Preferred Credit Card at a Chabill’s location; (2) complete and submit a rebate form, together with a copy of the original invoice, that is postmarked by 6/30/2019. Customers who use their Synchrony Car Care Credit Card or Truckers Preferred Credit Card for their qualifying purchase will be eligible to receive a $50 Visa Prepaid Card on a purchase of $499–$998.99, or a $100 Visa Prepaid Card on a purchase of $999–$1998.99, or a $200 Visa Prepaid Card on a purchase of $1999 or more. Purchases with a Synchrony Car Care Credit Card or Truckers Preferred Credit Card are subject to credit approval. One rebate per purchase valid at participating U.S. Chabill’s Tire locations. See store for details. Original equipment manufacturers, fleets, wholesalers, commercial accounts and purchases for resale are not eligible for this promotion. Visa Prepaid Card will be sent to customer’s address provided above within 6 to 8 weeks, after receipt of this completed rebate form. If Visa Prepaid Card is not received after 8 weeks, call 1-833-396-8072 or visit SynchronyCarCare.myrebatemanager.com to inquire about status. If Visa Prepaid Card is not received, you must inquire no later than 9/8/2019 or all rights hereunder will expire. Visa Prepaid Card is issued by MetaBank®, Member FDIC, pursuant to a license from Visa U.S.A. Inc. No cash access or recurring payments. Can be used everywhere Visa debit cards are accepted. Card valid for up to 6 months; unused funds will be forfeited at Midnight (EST) the last day of the month of the valid thru date. Card terms and conditions apply, see MyPrepaidCenter.com/site/visa-promo. MetaBank or Visa does not sponsor or endorse the optional Synchrony Car Care Credit Card or Truckers Preferred Credit Card. Subject to credit approval. Valid everywhere Synchrony Car Care is accepted in the U.S. and Puerto Rico. Gas station purchases are not eligible for promotional financing. Minimum monthly payments required. See store associate for details.